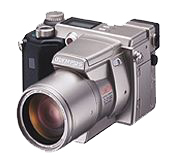 I was looking at several 3-megapixel cameras, but after talking to Don Bradner about his new Olympus C-2100 camera, I started looking at the specs and reading the reviews of the camera. After a couple of days of investigating, I ordered one for myself just a few days before the VB MVP Summit in Redmond. I've had the camera for a couple of weeks now, and I'm very happy with it. In fact, Randy Birch was so impressed with the camera that he bought on in Seattle before returning to Canada. Shutter priority: Still image - 1/2-1/750 sec. (used with mechanical shutter); 1/3 EV steps; Program, S-Program, Aperture Priority 4 sec. to 1/750 sec.